We waited for them near the new enclosure as we made the final touches on the climbing structures and, at 10:00 a.m. on Sep. 17, 2013, they arrived. Nine female baboons peered out of their transport crates with anxious, pale face - their curious dark eyes absorbing every movement and sound. 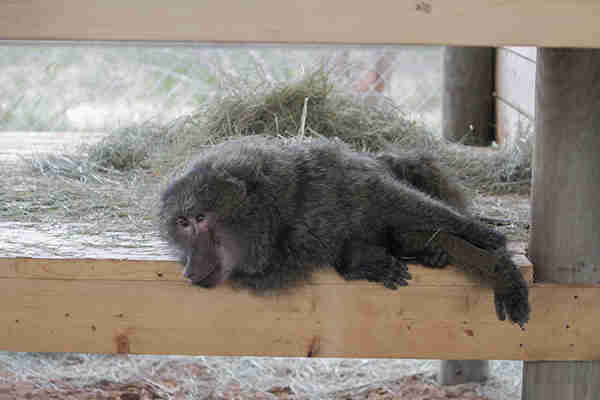 A result of a collaborative effort between the Born Free USA Primate Sanctuary and a large laboratory, these baboons were the lucky ones and would have the opportunity to live the remainder of their lives in a sanctuary. This doesn't happen very often, as almost all primates utilized in research are humanely killed without ever experiencing the feeling of grass underfoot, or the calming sensation of picking leaves from a tree, or the liberating act of jumping from limb to limb in a rush of excitement. But, thanks to Born Free USA and everyone at the laboratory who was involved with the baboons' care, nine would have the chance. As each transport crate was aligned with the guillotine gate that led to freedom, it would rock slightly as the girl inside moved about, trying to get a better look at what was to come. A few of the baboon girls hesitated when the door was opened and took their time to examine the new surroundings before walking out calmly, but most appeared to fly out of the crate, eager to escape confinement and ready for whatever was next. Most of the girls immediately climbed up the side of the fence in their safety areas rather than remain on the ground. They had grown up in cages and we assumed that the metal was familiar to them - but it didn't take long for them to explore the wooden platforms and start nibbling on the hay scattered throughout the area. The platforms quickly became the favored spots, though it was sad to watch as they struggled, with limbs weak from years of inactivity, to pull themselves up on top of the structures which were only three feet high. 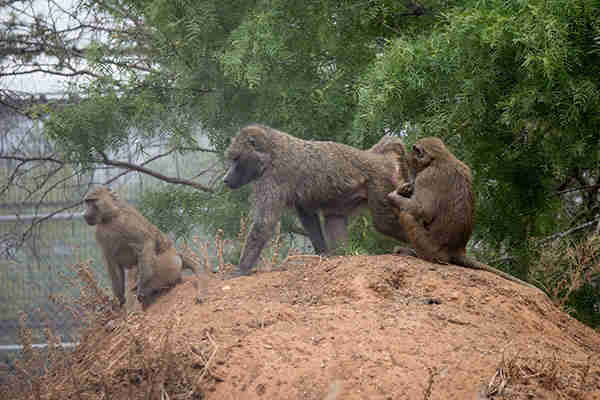 Despite their lack of conditioning, the baboon girls rapidly got down to the essence of baboon social structure: who was going to be the alpha and end up leading this group, and who was going to fill the other positions. We winced and grimaced as they attempted to chase each other around the safety areas, their weak bodies stumbling, flailing, and sometimes even nose-diving into the hay. 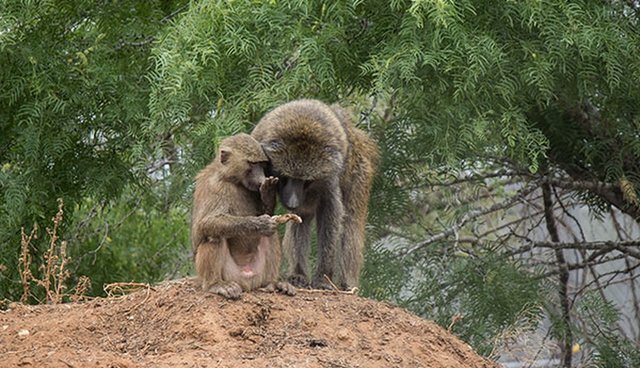 Through the daily social drama for which baboons are famous, two things began to happen simultaneously: a hierarchy was slowly beginning to appear and those soft, frail bodies were getting stronger by the week. By November, we all felt that the girls had strengthened and socialized enough for them to take the next huge step in their lives, so the gates to the main enclosure were opened for the first time. Here were trees, grass, flowers, rocks, climbing structures, large covered platforms, and a large covered pool in the middle. Within minutes of opening the gates, the still pale-faced baboon girls were busy spreading out through the enclosure, trying to look every direction at once, and occasionally stopping to pull a sticker from a tender foot. Several formed small groups on the platforms and began grooming each other: an all-important act among primates that yields tremendous social and physical benefits. After only three days in the large enclosure, it seemed as if they had been there for years and looked perfectly comfortable amid the mesquite and savanna-like grasses. Over the winter, the social dynamics continued to evolve, but it was mainly a loose-knit structure without any clearly defined rankings. As their bodies continued to gain muscle and those pale faces slowly darkened to a normal baboon color, their natural athleticism began to shine through and they leapt up onto the platforms where they once had to crawl. And, when three youngsters joined the group, "Lucky Nine" girl Missy took them under her wing and taught them how to grow up. I regret to report that, just last month, on Sep. 12, we lost Missy despite a tremendous effort by Dr. Johnson and our staff to save her life. Though we're all greatly saddened by her passing, we're comforted by the high quality of life we were able to provide for her these last two years. We're honored to have been of service to her and her group. 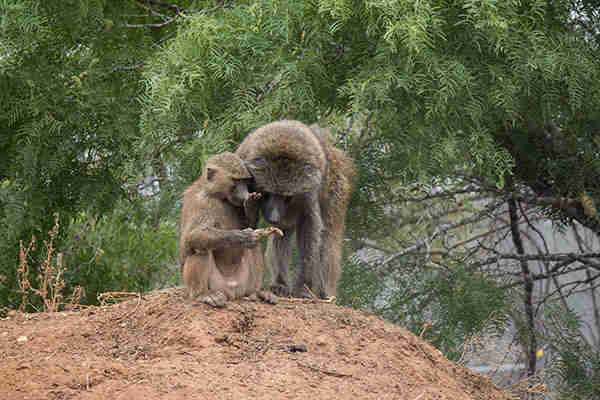 When given the opportunity, these once-caged baboons grew and matured socially and physically, and now flourish in an environment free from constant fear and anxiety. And, that's a testament to their resiliency and adaptability - and it's a reason for compassion and humility when we look out at the world around us.